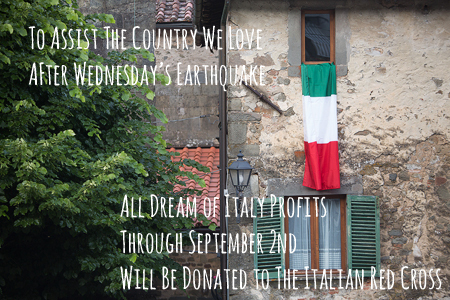 We are offering our BEST DEAL EVER on a membership to Dream of Italy! PBS series host Kathy McCabe founded the award-winning website and magazine/newsletter 16 years ago and it served as the inspiration for the hit TV travel series now in its second season! Join and find out why media outlets like The New York Times, ABC News, USA TODAY, National Geographic Traveler and Businessweek recommend Dream of Italy to help plan any trip to Italy – whether it is your first or 14th! All memberships give you immediate online access to 160 back issues of our award-winning magazine/newsletter (PDFs) featuring everything from Italy’s best cooking schools and tour guides to tips on where to eat and where to stay in Italian destinations from the Amalfi Coast to Venice – the most extensive archive of Italy travel information on the Internet. 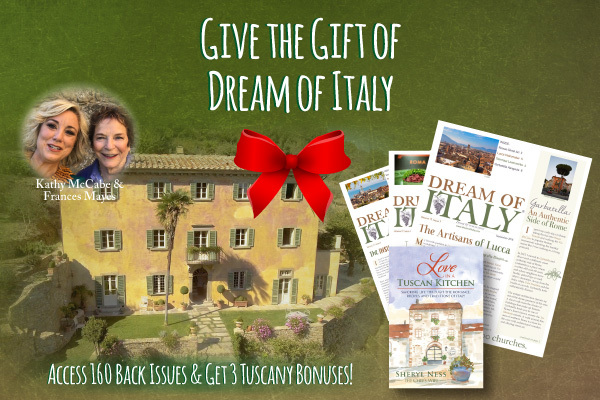 CLICK HERE TO WATCH A QUICK VIDEO with Frances Mayes, author of Under The Tuscan Sun, loves Dream of Italy and why she thinks YOU should JOIN Dream of Italy! Choose print memberships (six months for $57 and one year for $87) if you would prefer to receive upcoming newsletter issues in the mail. You will also receive immediate online access to back issues and travel discount codes. Or give a membership as a gift! As I read the articles in Dream of Italy, I’m magically transported to Italy. I can almost smell the aroma of good sauces simmering on the stove, smell the vineyards grapes warming on the vines, taste the full bodies wines, feel the warmth of the sun, become breathless after hiking up the mountains….oh I could go on and on. Dream of Italy gives me an escape from everyday routines and energizes me! NO RISK: 30-Day Money Back Guarantee! If within the first 30 days of your membership, you are unsatisfied, simply request a full refund. ONLINE ACCESS to more than 160 back issues — 1,800+ articles — including dozens of special reports on Rome, Venice, Florence, Sicily, Tuscany, the Amalfi Coast, Cinque Terre, cooking schools, tour guides, Italian genealogy, taking kids to Italy and more! MEMBER-ONLY TRAVEL DISCOUNTS on villa rentals, cooking classes, hotels, walking tours, genealogy services, car rentals and more. CLICK HERE TO GIVE A GIFT MEMBERSHIP! If you would prefer to process your membership over the phone, call us at 202-297-3708. $77 $47 ONE-YEAR Digital Subscription (PDF Copies) $30 SAVINGS = BEST DEAL! Remember our 30-Day Money Back Guarantee.